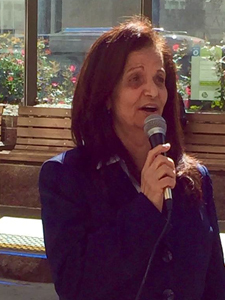 About 100 hundred supporters from Chicago, Ohio, Minnesota, Florida, Indiana, Wisconsin, and Michigan rallied for Palestinian community leader Rasmea Odeh in front of the U.S. Court of Appeals for the 6th Circuit in Cincinnati yesterday. 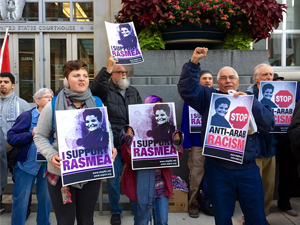 To chants of “Out of our communities, out of our mosques, FBI go get lost!” – the group waited for a critical stage in the USA vs. Rasmea Odeh case to begin. Little did they know that all the cases they would listen to in the Appeals Court would represent a microcosm of the greed, attacks on unions, and the suppression of Palestine activism in the country. Odeh had been sentenced on March 12 to eighteen months in prison and deportation to Jordan unless she could win an appeal in front of the three court justices – Karen Moore, Alice Batchelder, and John Rogers. The government claimed that Odeh unlawfully gained U.S. citizenship by giving false answers on her visa application in 1995 and on her naturalization application in 2004 when she failed to disclose her conviction by the Israelis of participating in bombings in 1969. The conviction in a military court was the result of a coerced confession made after she was tortured and raped by Israeli military authorities. As a result of that torture, Odeh was diagnosed with chronic Post-Traumatic Stress Disorder (PTSD) by world-renowned psychologist and torture expert, Dr. Mary Fabri, that in the words of the appeal “blocked her from understanding the time frame in the questions that were answered falsely.” The defense team argued she was not given the opportunity for a fair trial when the expert witness testimony was denied. 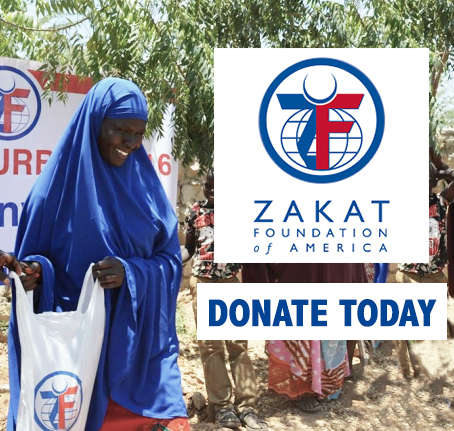 After the announcement of “God save this honorable court,” the first of two other cases were heard by the three judges while the Odeh supporters that had packed the courtroom waited patiently. The first case was concerned mortgage fraud and money laundering. The defendants in the case had apparently unlawfully moved money for mortgages around from their small company account to personal accounts. One has to wonder where were the executives of the large banks and investment companies who also defrauded consumers and did their own version of “investment laundering.” It was another reminder of the economy collapse in 2008 and all the mortgage holders who lost their homes due to systematic greed. The second case involved the International Union of Operating Engineers Local 18 who was fighting for the chance for arbitration with the Ohio Contractors Association over a highway construction contract. 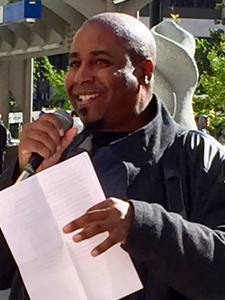 The legal battle was over a technicality in the language, but the union had to go all the way to the Federal Appeals court just to get approval for the case to go to arbitration. Anyone listening who could see through the wrangling over legalese, would also see the contractors for the State doing all they can to prevent a union from seeking arbitration. Both of these cases represent major social issues, i.e. continuing mortgage industry fraud where consumers are never made whole and the executives of large investment companies are rarely charged and the ongoing challenges by state governments to union bargaining and arbitration rights. Soon Odeh’s case would be heard, a case that spoke to the heart of racial profiling, surveillance, and the suppression of activism, especially Palestine activism, that had escalated over the last two years. In both cases, the three judges continually interrupted the defense and prosecution attorneys to challenge their points. The rulings cited were questioned, the logic of their arguments exploded, and absolutely everything was interrogated. Listening to these judges, Odeh supporters knew that at least this time she would get a fair hearing. But they also knew that Odeh’s defense team had only 15 minutes to present their case and 3 minutes of rebuttal. The original prosecutor of the case, Jonathan Tukel was next for an intense grilling by all three judges. His primary argument was that according to a “Willis” case that psychological expert testimony could only be used when there was an insanity defense. Judge Rogers was particularly critical of Tukel using multiple examples of when someone would be in a state-of-mind of not understanding the question from a language barrier or having amnesia where expert testimony would be required. He also indicated that the “Willis” ruling was a “1990 unpublished order and is not binding on this case.” A clearly rattled Tukel would have to be reminded again of this fact when he returned to the same argument in his rebuttal. 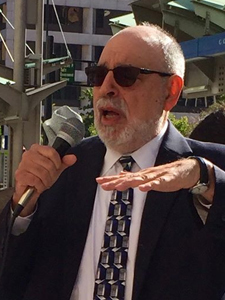 Michael Deutsche ended strongly with his three minute rebuttal stating that the statutes leave it open on how to use psychological expert testimony and that it goes to the heart of the prosecution’s indictment that Odeh specifically lied to obtain her naturalization. The oral arguments in the Appeals Court had none of the oppressive atmosphere of Odeh’s trial where the Judge often made prejudicial statements about Odeh and her supporters to the jury. There was also no heavy DHS security presence to intimidate those in the room. The three judges were clearly demanding answers from Prosecutor Tukel about the questionable nature of his case’s foundation. There was definitely an impression that the judges could imagine a possibility where someone could answer “no” to questions because they were in a state of mind that prevented them from fully understanding the questions. There also seemed to be puzzlement about why the expert testimony was not allowed in the original trial. Rasmea Odeh had the final word to all of her supporters. The Rasmea Defense Committee will continue to fundraise, organize public events, gain supporters, and promote Rasmea’s case to media across the country and the world. 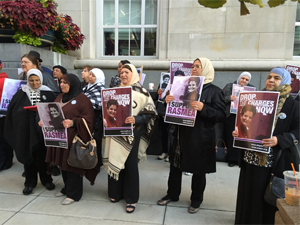 For more information and background on Odeh’s case, visit the Rasmea Defense Committee website.